WADA says that Salbutamol abuse was not endemic in professional cycling, providing more details in the wake of Chris Froome's case. The World Anti-Doping Agency (WADA) said Wednesday that Salbutamol abuse was not endemic in professional cycling, providing additional details in the wake of Chris Froome‘s case. After the UCI unexpectedly dropped the case against Sky’s Chris Froome the week before the Tour de France, critics questioned how WADA handled the case and asked for more details from the international anti-doping body. WADA’s latest statement characterized Froome’s case as ordinary, emphasizing that the rule’s current Salbutamol threshold is correct, based on scientific literature. The statement also included a timeline of its interactions with the UCI, as well as Froome, during the months-long ordeal. However, WADA said that Froome did not prove this in a lab test, given how hard it would be to reproduce the circumstances of the 2017 Vuelta a España, where he provided the sample in question. Instead, Froome and his legal team provided a “substantial explanations,” as well as evidence, which were reviewed by in-house and external experts at WADA in early June. Based on that evidence, WADA decided that Froome had not broken a rule. “It was accepted by the UCI, however, that in this case such a study would not have provided reliable evidence as it would be impossible to adequately recreate similar conditions to when Mr. Froome was subjected to the test, taking into account his physical condition, which included an illness, exacerbated asthmatic symptoms, dose escalation over a short period of time, dehydration and the fact that he was midway through a multi-day road cycling race,” the statement said. 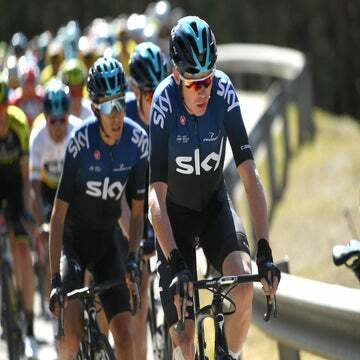 WADA also said that prior to receiving Froome’s explanation of the incident on June 4, it believed the case should go through a controlled pharmacokinetic study in the lab, which might have resulted in disciplinary proceedings with the UCI and Court of Arbitration for Sport. Instead, WADA says the case’s conclusion was fair and correct. – 20% (eight out of 41 cases) resulted in acquittal. – Approximately 50% (21 out of 41) resulted in suspensions. – The remainder of cases included a range of circumstances, including where the athletes received reprimands, where they were competing in a sport that was not a signatory to the World Anti-Doping Code or where they had valid Therapeutic Use Exemptions (TUEs). – 14% (eight out of 57 cases) resulted in acquittal. – Approximately 50% (30 out of 57) resulted in suspensions. – The remainder of cases included a range of circumstances, including where the athletes received reprimands, where they were competing in a non-signatory sport or where they had valid TUEs. When WADA received Mr. Froome’s substantial explanations and evidence on 4 June, the Agency promptly reviewed them together with both in-house and external experts and liaised with the UCI before communicating its position statement on 28 June. Then, on 2 July, UCI announced its decision to close the case.